The aerospace quality standard AS9100 is applicable to the Pontus Quality System. Last week we preformed a successful transition to new revision D.
At Pontus we care a lot for quality. In our management system we emphasise on controlling risk, focus on delivery performance and identification of products. All these are key items in this standard. 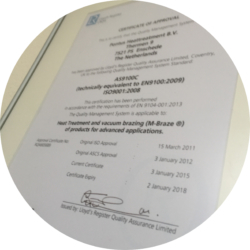 Therefore we passed the recertification audit performed by a Lloyd’s auditor. And for the fifth year in row without any corrective actions to be taken.